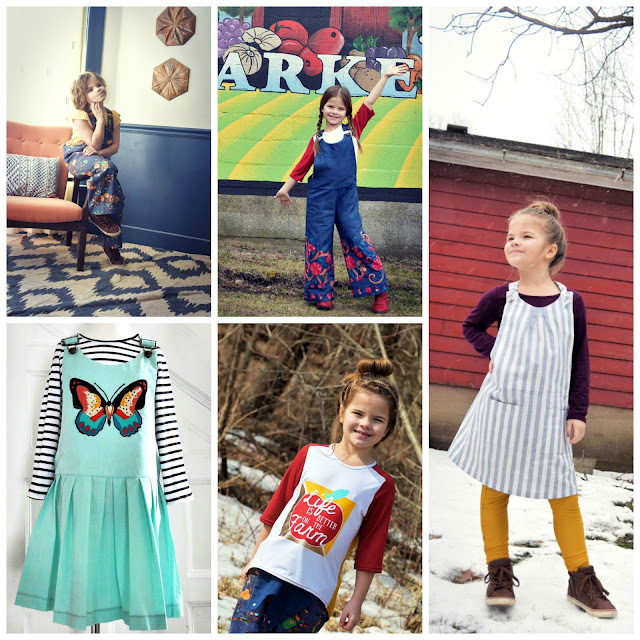 Today we have Carin of Art Bella Creates sharing her creations for the Project Farmer's Market lookbook. Project Farmer’s Market capsule wardrobe collection released in March and what an awesome collection. Have you seen the lookbook yet? So many ways to mix and match and suitable for a wide age range, appropriate for all seasons by layering and many options for both boys and girls. I sure love a pattern that I can use for both my kids. The idea of a capsule wardrobe is very appealing as it makes it easier to drop and add an item at a time as my kids grow which means I don't have to sew/replace a whole wardrobe every season. I was lucky enough to test the Jonagold Jumper as part of the collection and love the versatility it provides. I love a pattern I can modify and the jumper fits the bill quite perfectly. The possibilities are endless. I used the Up Beet Tee pattern for under the jumper. The unique lines makes it the perfect tee for color blocking. The fit is very comfortable yet still perfect for layering, I appreciate the length of the shirt for underneath the jumper. I did sew up a few modifications of the jumper and both the tee and jumpers are in heavy rotation right now. I am excited to build on her wardrobe with more pieces from the Project Farmers Market collection.